The Vuelta opens with a 27.4km TTT from Vilanova de Arousa along the Galician coast to Sanxenxo. It is a pretty flat, non-technical course that will benefit from tailwinds along most of the route. However, as they turn east into Sanxenxo, there may be a bit of an issue with crosswinds during the final couple of kilometres that might add a slight challenge. 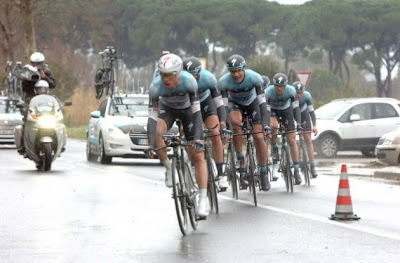 The course will suit the big powerhouse time triallers, so Omega Pharma Quick-Step with Tony Martin and Radioshack with Fabian Cancellara have to be high up in our consideration. While OPQS might not have their strongest team here, Tony Martin showed in the Tour de France what he can do, putting in a monstrous shift despite his injuries to almost single-handedly drag them to the stage win. He is backed up by the likes of Vandewalle, Stybar, Pauwels and Meersman and they start as the strong favourites. Radioshack have a strong team here, driven by Fabian Cancellara. He will be supported by a strong cast of GC men in Horner, Kiserlovski and Zubeldia, plus Hermans and Popovych and they could have a real chance of snatching a stage win and the leader’s jersey if OPQS slip up. Astana are the other team that are strongly fancied. They do not have any out-and-out time trial specialists, but have a very strong team with the likes of Janez Brajkovic, Tanel Kangert, Andriy Grivko and, of course, Vincenzo Nibali. There are few weak links and they will be hoping that they can spread the work to keep men fresh and take an early lead. The other team that could challenge is Movistar. They won this stage last year, but that was on a hillier course that suited them far more. They are also missing their strong time-triallists and I would be surprised if they can repeat their win from last year. Without the power of Wiggins, Froome or Porte, this could be a tough stage for Sky and they will simply be hoping to limit their losses rather than seriously looking at the stage victory. Orica won the TTT in the Tour de France (much to our enjoyment), but I would be amazed if they were to win here – they simply do not have the team this time. Belkin will be hoping Stef Clement and their big men can help them drive to a good time. While they are unlikely to challenge for the win, it would be a surprise if they were to lose too much time on this course. The other teams will simply be looking to limit their losses. Joaquim Rodriguez will be hoping the Russians can put in a big shift to keep him from losing too much time, while the likes of Carlos Betancur and Ivan Basso will be hoping not to see their chances go up in smoke at the first hurdle.